Although The Legend of Zelda: Ocarina of Time 3D launched in the middle of the month, 11 days was all it took for the Zelda remake to establish itself as the second best-selling single-format game for the month of June. According to independent market research company NPD Group, more than 283,000 copies of the game were sold in the United States last month, a pretty good number considering the game was on the market for less than two weeks. As far as hardware goes, June saw Nintendo selling 386,000 units in the DS range, 273,000 Wii and 143,000 3DS consoles. That's more than 800,000 combined hardware sales for the month of June. Each platform also saw double-digit growth over the month of May. With all these additional Wii consoles that Nintendo has sold, the total installed base in the United States now stands at 36 million. Err, what was number one? Hurray, DS' are still outselling the 3DS! It makes me very sad that the DS obliterated the 3DS in sales. Nintendo REALLY needs to drop the price to 199.99 this holiday season! Consumers are doing the right thing. GO DS, NEVER GIVE UP! At first i was like, "L.A. Noire probably beat it"
Then i was like, "WTF HOW DOES ZUMBA FITNESS BEAT THIS?" but I suspect it makes Nintendo very happy. They are laughing that so many people are snatching them up during this fire sale, right on the precipice of it being phased out and completely ignored. Also, to those that are going "AWW YEAH DS BEAT 3DS." Ocarina of Time 3D far outstrips its 2D cousin, even with the nostalgia of the original. If the first good 3DS game lost out in sales to zumba fitness, then I think the 3DS is in some serious trouble. Totally and utterly expected. Zelda sells like hotcakes, no matter what type of game it is. Not to be a Debbie Downer, but 283k is terrible for what is considered the greatest game of all time. How many units has that bass fishing game sold now? 8 million? I was expecting a million seller in 2 weeks from OOT, so this is just another sign that things are not going as well as Nintendo hoped. I find it amazing that I've heard on at least 3 occasions when walking around the game section of a store some mother or grandmother asking a kid, "So do you want a DSi, or a 3DS?" as if they're comparable devices like a PS3 or 360. I always want to be like, "Come on kid, are you an idiot?! Don't answer that question seriously! Why would you CHOOSE a piece of technology that technically obsolete when you have the option?" It's like, in a year if I ask you, "Do you want me to buy you a Wii or a WiiU? Even if you're a WiiU critic, it can play Wii games, still, and undeniably is an all-around more powerful machine. The Wii would have NO advantages over the WiiU, except price, and if it's not your pocket... it just doesn't make sense as a serious question. We all know Nintendo's not going to keep supporting the DS. It'll only be little DSiWare developers... and even that will only last for a couple more months until 3DSWare comes into its own. Ugh. If I hear that question again, I'm going to give the kid some sense. Why are they still selling by the bucketload? OOT only came out in Canada/here a few days ago, but I got this game. @bro2dragons I agree with you, man. People are silly! The only thing the DSi has over the 3DS is Flipnote Studio, and a better battery. Who cares what other ppl buy? Link to the NPD data? So is a Majora's Mask 3D on the table now? I'd ask how the DS outsells the 3DS but the answer is simple, most people are either waiting for the price to go down or the new model (in the case of our connoisseur demographic, it's probably a combination of the two, and more games). I'm proud to be an owner of OoT 3D! @bro2dragons: I agree with you for the most part, but there's actually a better reason to choose wii over wiiU. Wii can play gamecube games, making the decision a little less obvious. I didn't see it last month since it launched in Australia on June 30th but I saw it a week later! GHEESH, the DS sold almost 3 times as much as the 3DS. As far as OoT, that number is fantastic for less than 2 weeks on the shelf. ive been working and still haven't gotten to master quest yet .. I know I know! I believe the DS had a price drop to $99 on June 5th. I'm sure that helped boost sales for the month. 3DS continues to sell terribly. I'd like to think Nintendo has learned something from the putrid sales but I doubt it. What's really disturbing to me though is the Wii continues to sell well despite having nothing worth a damn coming out this year or next besides Zelda: Skyward Sword. Even worse, 360 sold over 500K for the month and that system has a lineup just as pitiful as the Wii's this year. North American consumers really are stupid, there's no reason PS3 shouldn't be topping the competition this year. And the sentence "Five of the top ten and 13 of the top 25 best-selling software titles were developed for Nintendo platforms." can also be misleading, because you can get the feeling that these games were released only for Nintendo consoles. Also: Isn't it journalistically the best thing to, at least, include the charts? @24. on a summer month on a new platform? Those copies of Zelda all went to starved users. Myself included. It pulled in 7.9 mil on n64, they haven't sold that many systems yet. "Nintendo REALLY needs to drop the price to 199.99 this holiday season!" Considering that the PSvita will only cost 170 Euro's in Europe (from what I have heard), I hope Nintendo goes even below 200 Dollar/Euro's! I have a little bit of fear that Nintendo thinks: "The Mario titles (Mario bros 3D and Mariokart 3D) will sell the device during the holiday". Noooooo, lower the price you greedy bastards!!! Everyone needs to give the 3DS some time. The DS wasn't exactly the greatest console ever when it was first released. We also need to consider the fact that Nintendo loves hardware updates, people might be waiting for a newer, better 3DS to buy. The DS is selling better because of 3 things. The recent price drop in the DS Lite, the fact the there are 3 different models of the DS available right now, and a library of fantastic games. The 3DS at the moment lacks all 3 of the those. 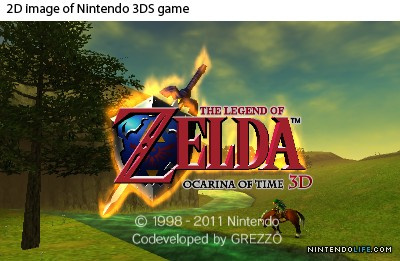 Though Ocarina of Time 3D is fantastic, most people will need more than one game to really want a console. Give it some time, it might not do well, but it might end up selling as well as the DS, though that seems hard to top. It's too soon to tell yet. @L_Brown Thanks for your email. I've adjusted the story accordingly. As for reproducing the charts, I know in the UK at least you have to buy a licence to reproduce the charts here — not sure if it's the same for NPD. I'll look into it, though. What was #1? Does anyone know? @ Sakura_Moonlight2421: I posted the list in the comment #43 .